Explore MoJo’s interactive map of the anti-Wall Street protests that unfolded worldwide in fall 2011. The loose-knit protest movement known as Occupy Wall Street has stirred action from New York City to LA and spread overseas. Here we present an expanding map of protest hot spots and reported arrests, and track the movement’s growth. Check back often for updates—and check out all the rest of MoJo‘s #OWS coverage here. Know of more locations for this map? Send a link to a news article or blog posts to traja [at] motherjones [dot] com or @tasneemraja. Map production by Lauren Ellis, Samantha Oltman, and Tasneem Raja. A huge share of the nation’s economic growth over the past 30 years has gone to the top one-hundredth of one percent, who now make an average of $27 million per household. The average income for the bottom 90 percent of us? $31,244. 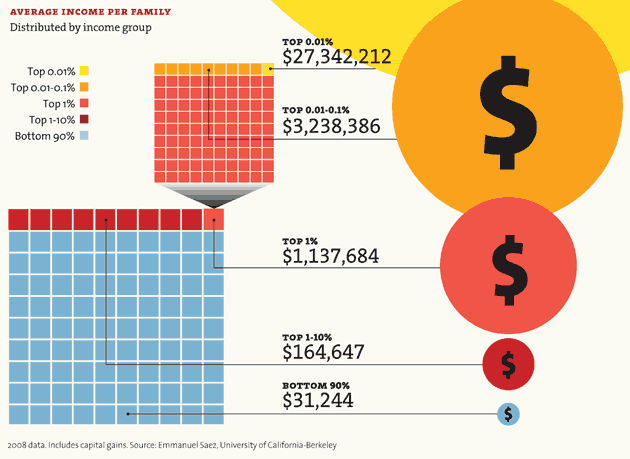 See all of Mother Jones‘ inequality charts here. July 13: The Canadian magazine Adbusters makes a call to Occupy Wall Street. August 30: The hacktivist collective known as Anonymous releases a video answering the call and encouraging others to follow suit. September 17: Nearly 1,000 gather to protest corporate greed and begin occupying the financial district in New York City. September 19: Roseanne Barr is the first celebrity to lend support to the so-called NYC General Assembly. September 20: The NYPD starts arresting protesters for wearing masks, citing an arcane law that prohibits masked gatherings of two or more people with an exception: “a masquerade party or like entertainment.” The police soon become more forceful. September 22: Demonstrators interrupt a Sotheby’s Auction, “in a show of solidarity with the art handler’s union that had been locked out.” This is the first instance of labor unions and the movement locking step. September 24: 80 protesters are arrested during a peaceful march; a video of a police officer pepper-spraying a nonthreatening woman goes viral. September 26: Anonymous allegedly leaks the name and details of the police officer who wielded the pepper spray. September 27: The Occupy Wall Street campaign comes out in support of postal workers who are protesting their reduced five-day work week. September 28: Transport Workers Union votes to support Occupy Wall Street; over 700 Continental and United Airline pilots demonstrate in front of Wall Street. September 30: More than 1,000 demonstrators march on NYPD headquarters, protesting the police response against the demonstrators. October 1: Over 700 demonstrators are arrested for marching across the Brooklyn Bridge and blocking traffic. October 5: Major labor unions endorse the movement and join in a march on New York’s financial district. According to ABC News, as many as 15,000 participate in the march. October 6: Demonstrations spread to hundreds of US cities and around the world, with a global day of action planned for October 15. President Obama comments on the Occupy Wall Street protests. October 10: In a late-night crackdown, Boston police arrest more than 100 protesters in Dewey Square. The clash includes members of Veterans for Peace. October 12: At 7 AM, protesters in San Francisco engage in a sit-in in front of Wells Fargo headquarters. With entrances blocked for over five hours, the office decides to shut down for the day. Police arrest 11 demonstrators. October 14: Protesters successfully thwart an eviction from Zuccotti Park. Arrests are on the rise in Denver; Seattle; Gainesville, Florida; and Portland. October 15: The Global Day of Action brings tens of thousands out to the streets. In New York, several protesters are removed from a Citibank branch at Washington Square Park in New York City. Twenty arrests are confirmed. Riots break out in Rome, Londoners attempt to occupy the London Stock Exchange, and demonstrations take place in over 80 countries. Local police arrest protestors in Denver, Chicago, and Raleigh, North Carolina, and raid the encampment in San Francisco. October 17: Adbusters calls for a global protest on October 29, demanding that leaders meeting at the G20 summit in France impose a Robin Hood Tax. The tax levies 1 percent on financial transactions and currency trades, which would raise funds to protect public services, fight climate change, and combat poverty. October 21: Nearly 100 demonstrators are forcibly removed from their City Square camp site in Melbourne, Australia, enduring eye gouging, pepper spraying, dragging, and brutal punches to the face from riot squads. October 25: Oakland police crack down on the encampment at Frank H. Ogawa Plaza, unleashing rubber bullets, flash-bang grenades, and tear gas on the protesters. Police arrest 97 occupiers after tearing down tents and destroying the site. October 26: On the heels of the Oakland crackdown, Atlanta police move in on Woodruff Park and arrest 53 protesters, clearing the park by 2 a.m.
October 27: The General Assembly votes for a general strike in Oakland on November 2. The proposal passes by a vote of 1,484 to 46. November 2: Occupy Oakland’s general strike peacefully shuts down the Oakland port. Late night clashes between protesters and police follow after protesters occupy an abandoned Traveler’s Aid building and barricade surrounding straights. November 17: A mass demonstration in New York protests the recent crackdowns on encampments nation-wide. Wall Street Suddenly Facing Reality?